The final part in this triptych aims at examining the differences between Bayer and non-Bayer sensors. 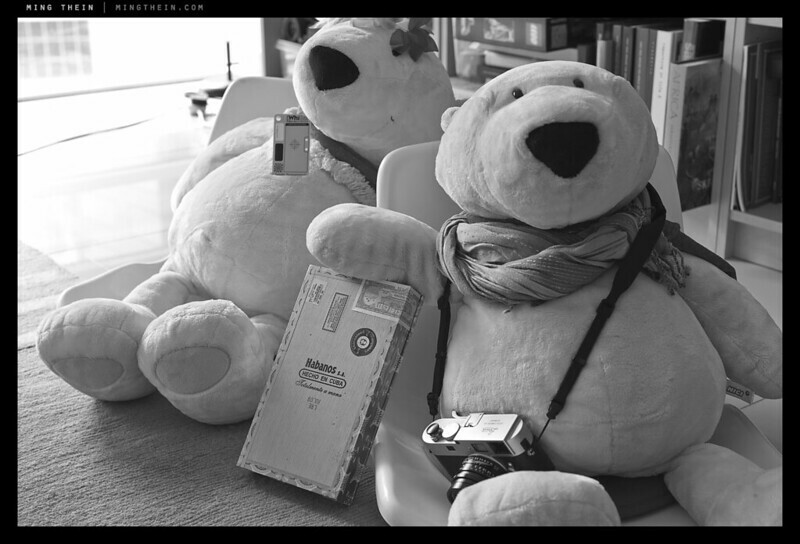 Part one was the review of the M-Monochrom; part two, the APO-Summicron 50/2 ASPH. Note: I’ve been informed by Leica that both camera and lens are prototypes, and there may be changes between now and the final release product. Operational and system differences aside, the aim of this portion is solely to look at how the sensors render images in black and white, and to examine pixel-level files and resolution advantages of the non-Bayer sensor. It’s frequently claimed that the Bayer matrix removes between 30-50% of the real resolving power of the sensor – i.e. a non-Bayer sensor of the same pixel count will have somewhere between 1.5x and 2x the resolving power. Since the M-Monochrom’s sensor is 18 MP and full frame, what better to compare it against the 36MP (2x) also full frame Nikon D800E? Both cameras have no antialiasing filter, which evens out the playing field somewhat. I’ll also go on later to look at noise, tonal rendition, and ultimate image potential, which is to say, what I can do with those files in the conversion. 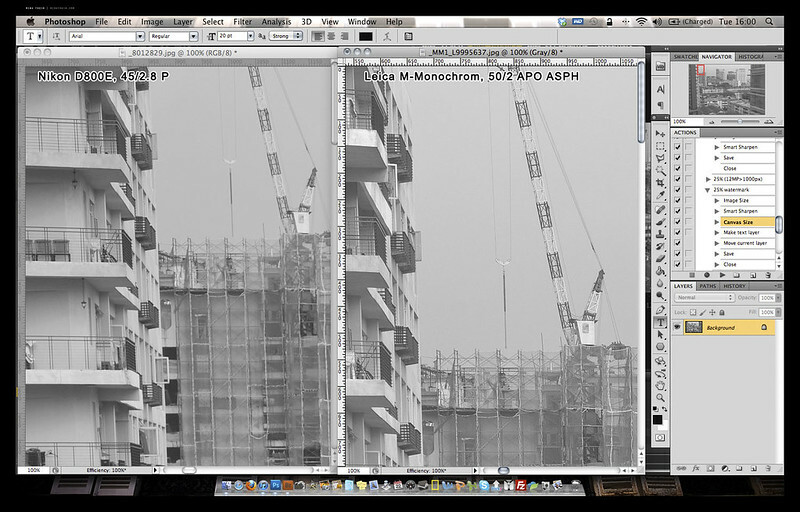 A note on testing methodology: for the direct A-B comparisons, both cameras were shot in lossless compressed RAW and converted via ACR 6.7 final release. 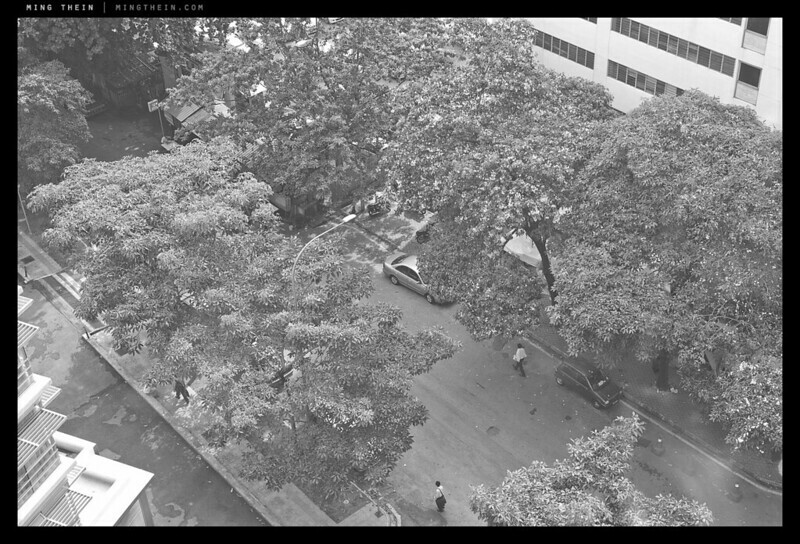 The D800E files were converted to black and white with a straight desaturation in ACR, and the M-Monochrom files upsized via bicubic smoother to match the output resolution of the D800E for the real image comparisons, and the D800E downsized for one set of the noise/ resolution comparisons to see if the comparison holds both ways. 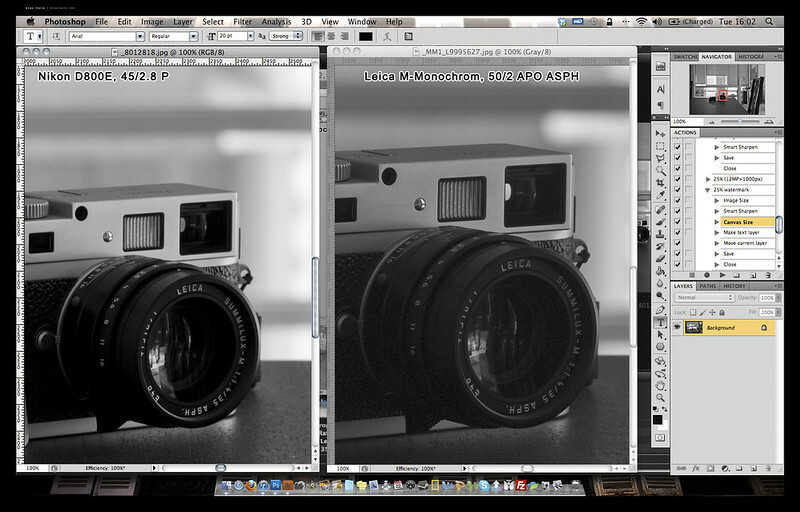 If sharpening was applied, it was applied consistently to both sets of images (and very minimally at that). The lens used on the MM was the 50/2 APO-Summicron-M ASPH (50 AA), the best lens that Leica currently makes; I didn’t have anything comparable to use on the Nikon (a Zeiss 2/50 Makro-Planar would have been perfect) – the closest thing I had was the Nikon 45/2.8 AI-P pancake, which is actually a fairly competent lens. The 45P resolves well at the focal plane, but lacks the flat-field and cross-frame consistency of the 50 AA – for all but the portrait comparisons, both lenses were shots at f5.6 or f8 to achieve maximum resolution. The D800E was focused with live view and magnification, and where possible, the camera moved to match framing (obviously impossible for the distant shots). As usual, go by what I say; do not make any conclusions from the actual images (which are there for illustration purposes only) – I’ve been looking at many full size, uncompressed images on a calibrated monitor. It’s pretty clear that the MM is very much holding its own against the D800E; or perhaps that should be the D800E is holding its own against the MM – at least in the center. The corners tell a very different story; this is more a testament to the resolving power and cross-frame consistency of the 50 AA than anything. Even at f8, the 45P lacks the bite and crispness of the 50 AA; note especially definition of the crane cables. Slight magnification differences aside, I’d say the M9/ 50 AA combination is resolving ever so slightly more than the D800E and 45P; look closely at the antenna sticking out of the roof box. It may be a different story if I’d had a better lens, but I doubt we’re going to get much more center resolution out of any combination on the D800E – I certainly haven’t seen it with any of my other lenses, including the 85/2.8 PCE. 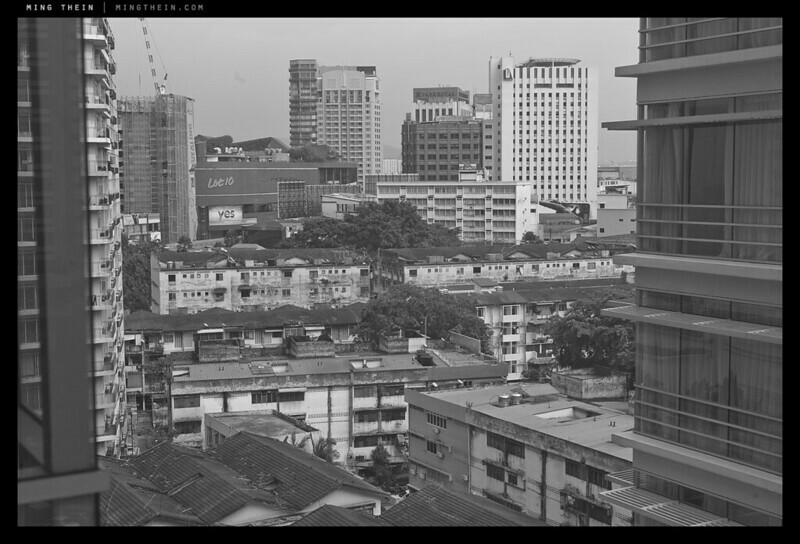 The second scene appears to be much closer in terms of resolution; it was shot at f5.6 on both lenses. The 50 AA actually has a slight advantage here as the lens is now three stops down from maximum, but the 45P is only two stops down. Both cameras resolve the foliage well, and texture in the pavement and road is retained – just. If you take a close look at the motorcycle’s wheel spokes and license plate, it seems like the MM is once again resolving a hair more detail, but there’s really not a lot in it – in fact, it could well be false detail due to aliasing at this point. I wouldn’t pick one combination over the other at this point. I did a number of other comparisons of various scenes, and could only conclude that the MM resolves at least as well as the current state of the art 36MP Bayer sensor. But for the most part, there’s not a lot in it – I would not pick one camera over the other on the basis of resolution alone. First set of noise crops. MM enlarged to match D800E native resolution. Full size. I didn’t bother with ISO 320 because they both looked almost identical to the ISO 640 crops, which is to say essentially noise-free. Highlight and shadow recovery were both set to 10/10 for each camera. It’s hard to say which way this comparison should go – one one hand, the MM has a much higher native ISO than the D800E (320 vs 100), and no added noise from the de-Bayering; on the other hand, it does use a CCD rather than CMOS sensor, which is known for having a higher noise floor to begin with. Once again, resolution appears to be a toss-up between the two cameras; the D800E clearly retains more useable resolution at higher ISOs. At the pixel level, the D800E begins pulling away from ISO 1250; the MM is probably a stop behind by ISO 2500, and nearly two stops behind by the time we get to ISO 5000. I’d put ISO 5000 as being okay on the D800E, with ISO 10k being useable for emergencies. This lowers by a stop on the MM. It’s interesting to note that despite the MM exposure being slightly brighter – the exposure settings for both cameras were identical – the noise affects not just the shadows (as with the D800E) but also clearly encroaches on the midtones, too. Lowering the exposure a fraction on the MM may have helped, but it wouldn’t reduce the amplitude of the noise – there are clearly noisy pixels that have been amped far enough that they are affecting the fine detail structure of the image. 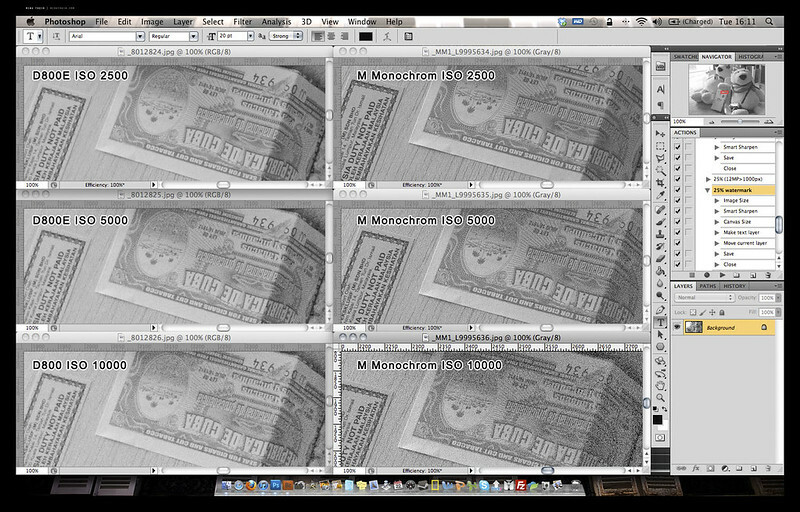 For the second set of noise tests, the D800E’s files have been reduced to match the size of the MM. I’m also looking at the highlight portion of the image. I’d say there’s no difference in noise or resolution to ISO 1250; the D800E’s files downsize reasonably well, but you can see some stairstep artifacts on the fine detail of the label – this is more likely a Photoshop artifact than a reflection on the resolving power of the camera. The story for high ISO is once again similar to before: the D800E has less noise, by 1.5-2 stops again. 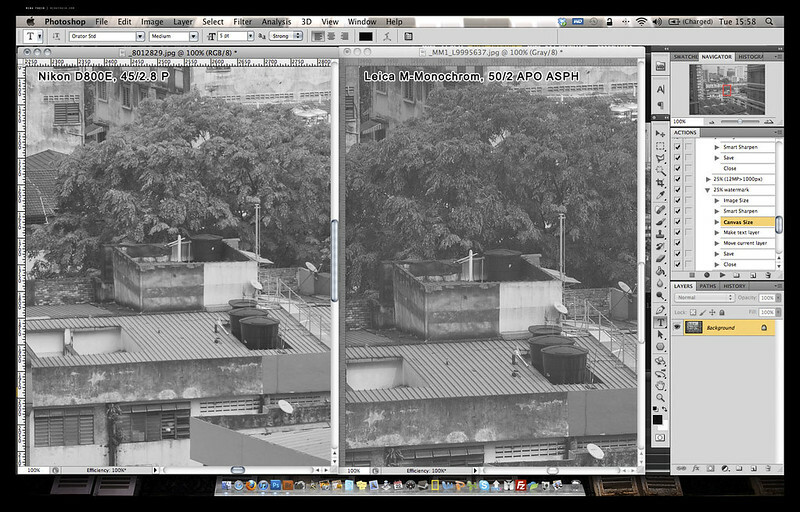 Curiously, the downsizing (bicubic smoother) has also reduced acuity of the D800E slightly. Intermediate conclusion: downsize or upsize files to match, it won’t make any difference. Reference bears again, full size image from the above crops. Although there is a huge amount of subjectivity introduced by the B&W conversion method, it’s safe to say that in general, a straight desaturation results in the lowest contrast image. Yet the MM images always land up being less contrasty than the D800E’s; it doesn’t appear that this results in there being more dynamic range – in fact, I’d say there’s if anything slightly less useable dynamic range (look at the noise in the lens barrel that isn’t there on the D800E image). What I’m seeing is a different tonal response curve that’s more shadow-biased; it’s probably something to do with the inherent differences in sensor architecture more than anything else. Is one better than the other? Only you can answer that, because it depends very much on your intended output. I don’t want to talk too much about bokeh, because that’s a property of the lens, not the camera, but in the crops, both lenses are delivering a pleasing out of focus rendition. And now is a very good time to talk about output potential: what can the cameras actually do, when the files are processed properly, in a real-world scenario? The portraits were lit by a 1000-LED daylight balanced panel (not that it matters for B&W conversions), with brightness adjusted to give a reasonable exposure to simulate daylight or indoor lighting – 1/90th at f2.8 ISO 640 or thereabouts. I’ve put a fair amount of work into the output of both cameras – basically, enough to the point that I’d be happy with the finished image. The tonal difference mentioned above – manifested as a sort of ‘lightness’ if you will – is again apparent here. I personally find the MM’s rendition a bit more pleasing to the eye, but there really isn’t much in it. Full size crops of the image follow below (you will need a screen with more than 1200 pixels across to view them); take your pick for resolution – I can’t say that one has more than the other. Microcontrast is slightly better on the MM/ 50 AA image, though. Often when we are writing reviews, comparing gear, or reading reviews, it’s very easy to get carried away and land up making a huge deal out of small differences. It’s pretty clear – to me, at any rate – that both cameras are capable of producing outstanding image quality, minor differences aside. Yes, the D800E does offer a stop more useable ISO, but then the MM makes up for it with lower shutter vibration and an easier method of focusing (if you’re using manual focus lenses on the D800E) – these somewhat cancel out when you’re handholding. The biggest difference again is going to be in the method of working – I’ve continuously found the D800E requires a bit more care to get the most out of it – it doesn’t really feel like a casual, fluid camera in the same way as the Leica Ms do. However, even though it’s more fiddly to focus, it’s also a lot easier to determine whether the image is in focus or not – using both back to back really reinforces how poor the MM’s screen is. And as mentioned in the MM review – you’re going to have to recalibrate your internal vision to see luminance values rather than contrasting colors and perceptual luminance. 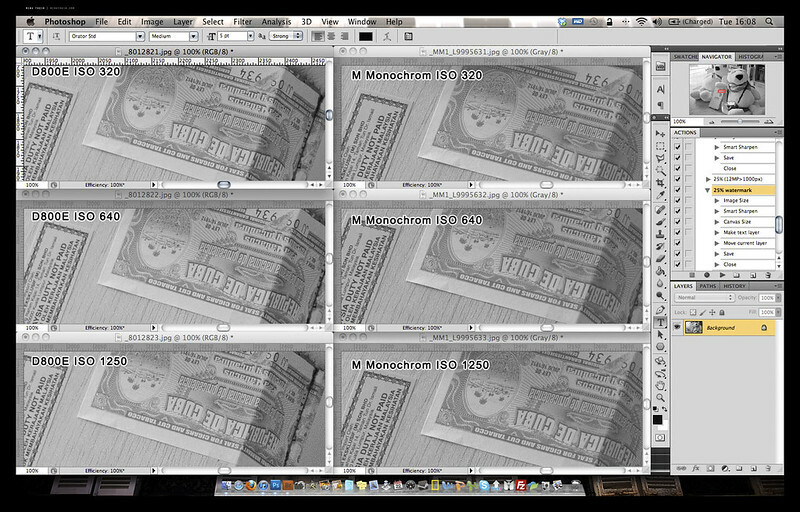 The MM does not see in the same way as you are used to with traditional B&W conversions, which take into account some of the color information when performing the conversion. Coda: There have been a huge number of people asking why I chose to use the ‘inferior’ 45P against the 50 AA. I want to clarify this logic here, and I continue to stand by the results of this test. 1. Aside from the single corner crop included out of curiosity, the center performance of both lenses at f5.6 or f8 at the pixel level is as good as I’ve seen out of any lens. 2. This is a sensor comparison. So we look at the center resolution of the sensor, which is the same as the edge resolution. We look at noise, dynamic range, tonal response etc – note I did not include color or microcontrast (those are also influenced by the lens). The former three properties aren’t. 3. Yes, I could have used a worse lens on the MM or a better lens on the D800E. But the reality is that nobody pays me to write these things, so I wasn’t about to go out and buy a lens I didn’t need for the sake of one test. 4. Finally, it’s a real world comparison. If I did have the MM and 50 AA, I probably would look into the camera cabinet and try to decide between that and the D800E/ 45P combination if I wanted that focal length. In the end I would select on a) noise, if I needed low light performance, b) if I needed color and c) weight. Both combinations are capable of stunning images. Both are also capable of utter rubbish. The biggest difference is the photographer, not the camera. The M-Monochrom is available here from B&H, and the D800E is here from B&H and Amazon. Thanks for yet another VERY meaningful article. This site is a real goldmine for those who are into all things photography. And such a liberating experience to find this high percentage of respectful commenters! In which case why waste your time, and the time of your readers with a useless test? Having a great lens on one camera and a so-so lens on the other invalidates the test. It tells us nothing about the relative performance of the sensors and helps no-one to make a decision if they were thinking of buying either of those cameras for Black and White photography. I thought you used Zeis Otus lenses with the Nikon D800. The Otus 55 f/1.4 on the NIkon would have evened things up and giuven us a MEANINGFUL result. Look at the date of the post: the Otus was not available at the time, or I would have used it since I have one. Because it is representative of practical reality. A very interesting and compelling review. Thank you! Most of my B&W work nowadays is produced on a Canon 5DII. I very much like what I see after post and feel that there is very little missing other than when I look at Nikon Scans of film from my 6×6 Rolleiflex. Even in small JPEGs on the Ipad I can see an obvious difference in tonality that I simply cannot repeat in my Canon/Lightroom/Photoshop work-flow. I don’t really quite understand why – is it just a factor of sensor size? You mentioned that the MM was producing more MF like files; I would really like to understand exactly what you mean by this, given that it is the same size sensor as the Canon. First off, do you mean more like good (Nikon/Imacon) scans from MF? If so, do you mean more resolution, greater acuity or finer tonality? Or a combination? Do you see this effect only with judicious post or even before? I ask this because in one of your replies to a question, you mention still preferring the Hasselblad film camera in certain situations. Does that mean that there is still something from that film format that digital 35mm cannot yet replicate? 1. The files are closer in tonality to MF because they share the same CCD architecture instead of CMOS as per most modern DSLRs. There is a nonlinearity to the tonal response that is pretty close to film. 2. Film has a very, very nonlinear highlight response that digital can’t even come close to matching. I still prefer it for extreme DR B&W work. 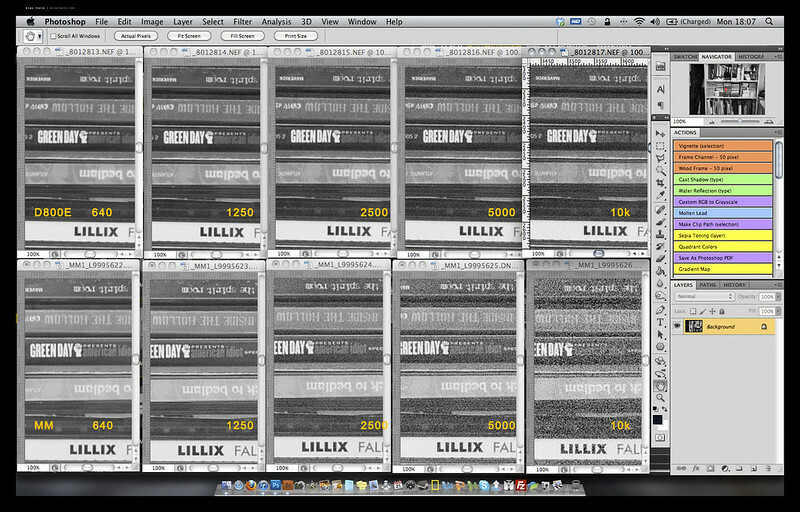 Seriously though, How big of a limitation is it that you cannot adjust the color channels on Monochrom files? Does it ever bother you if you are shooting someone wearing a certain color shirt against a certain color wall and on the Monochrom you cannot change the relationship between those colors the way you could had you shot it on an M9 and converted it to black-and-white? But if you wanted to shoot Black and White primarily in settings where you are controlling the light -like in a studio or shooting studio on location, which camera would prefer to shoot on, M240 or Monochrom? Which would give you better results after post processing the files? Monochrom, but I’d caveat that by saying I’d rather use my film Hasselblad over that. So, after almost a year I found this excellent comparison….thanks to your efforts and work!! real B&W workflow. Am I on the right track? You’re right – it’s like B&W film in that sense; you need to use filters to get it right at the time of capture, because you can’t change anything later. That’s taken as a given since the camera is completely achromatic. Interesting comparison and one I search Google for. My only thought is this: you absolutely need to fine tune every lens you own to the D800 body. Failure to do so, will mean that the lens/es will never perform at their optimum. Having owned a film M6 and a humble 35mm f2 (new version) I know that looking and describing that Leica look is somewhat difficult. I shot one roll of CN400 B&W film every week at every wedding I shot for years (Nikon F90’s and f2.8 zooms mostly), and there is a difference, not in 100% of the images, but just occasionally, you’d have to stand back and inhale, such was the effect, usually wide-ish open ….and that look! Now I am looking at a trip to Mongolia and feel a need to purify my soul once again. The D800E is nothing short of sensational, I adore the 50mm f1.4G lens and have become a complete convert to the standard lens format. With some £$£ in the bank and requiring 2x bodies, I was toying with another D800e plus the 24 or 28mm lenses, the 50mm and the 80mm plus the ubiquitous 70-200f2.8 zoom, but part o’ me wants to keep it b&w, go Leica again with similar lenses (not the zoom of course). I also know that when I shoot b&w (my M6 never, not in 10 years so much as sniffed a roll of colour film) I see things differently. Ask sebastiao salgado, whose work, Genesis, is now open in London’s Natrual History Museum for viewing from his latest 8yr project. I also know that the likes of the 7, Panos Pictures and other agencies still shoot much work on the Mamiya 6 (witness Taylor-Lind’s China images in this month’s National Geographic), and I have a love / not so love relationship with my Mamiya 7. I’d lov to shoot film on the 7 but film costs and bulk and no availability of any film in that neck o’ the woods makes me think that I should stay with the digital bodies. The total system weight is going to kill you, but the images will be worth it. I’d actually consider the Coolpix A for your wide option…the lens-sensor combination is outstanding. Value of the Camera + lens is already a big diference. Leica is way more expensive in these two combo, which is more than 4 times the Nikon combo…. I;m an amature but Im fortunate to be able to own 3 diferent system for diferent purposes, Canon-long lens for nature, Nikon-wide angles and up to 280mm, I have converted a numner of R lens to Nikon mount to use on the D800E, including a 35-70mm f2.8. I also own the Leica M9-P(Sold 2 months ago and waiting for M) and a number of M lens for travel and street, and I absolutely love it. It is also very light to carry around. But I have to speak out for Nikon’s D800/D800E. I was a Nikon user mainly on Nature Photography but switch to Canon for the AF four year ago. I kept my Nikon wideangle dueto the fact that Canon isn’t at their best making a wideangle lens, and when Canon failed to announce a hi-res DSLR in last Oct, I purchase a D800E to use the R lens that I own.. I feel that Mirror Vibration should not be an issue in D800, given activating of mirror lock up don’t take more than 5 seconds. And if we are to compare the sensors of the two cam, a lens of a exceptional quaulity should be used. The Leica 50mm AA, is suppposingly the best in the world, and if the 45mm P(US$450~US$600 uesd) can be comparable with it, it will not be worth the investment IMHO. There no no other 50mm comparable to what Leica’s M is offering, so If testing the sensors is the main objective, I feel that a lens of other focal lens should be used. 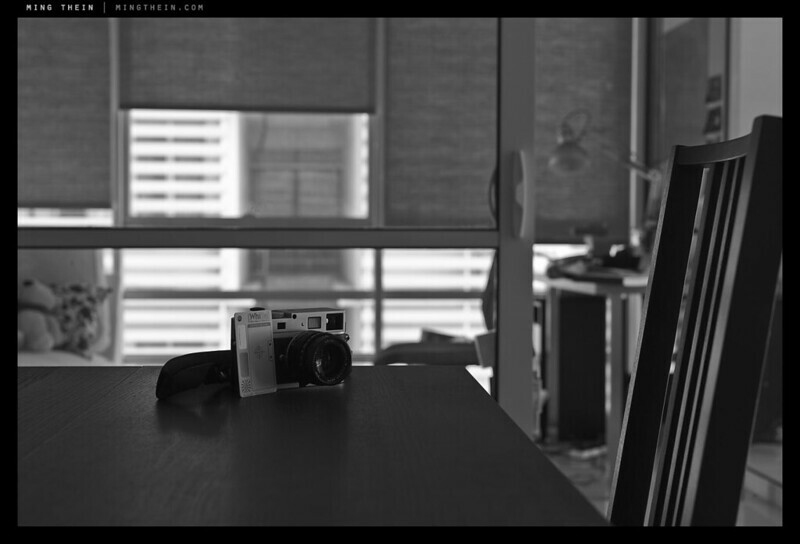 I would used a converted Leica R 90mmA on the D800E to compare with the Leica MM with a M90mmAA. The R and M 90mm AA have exactly the same optics with the exception of the number of apeture blade, where R has 8 and M has 11. These are just my humble two cents…. Hi Ming, I guess I am a little late catching up with your three part review. I certainly appreciate your comparison of sensors, the lenses are secondary. I had not realised that the non-Bayer sensor of the M displayed so much character when compared to the Nikon. I currently have an 800e which I use for long shots & macro. But I’m thinking of a Leica M also, I had an M6 back in the film days & recall reaching for in preference to my Nikon F4 I had at that time. Have you had an opportunity to assess the 24 mb Leica M by any chance? I am not sure I can go the extra expense yet, there are M9’s in mint condition appearing on the market now. Thank you so much for your enlightening reviews, & I do appreciate the way you have presented them. Jury’s still out on the new M since nobody has shot with it (me included), but you’re probably going to be a bit disappointed with the older M9 for color work, though the M Monochrom will probably surprise you for B&W. Ming, a lot of people may have read your methodology but most of them don’t understand lenses. They don’t understand that in the vast majority of cases, an expensive, fast Leica lens will not outperform a much cheaper slower lens. Leica lenses are no exception; the 35 Summarit 2.5 performs BETTER at f5.6 than the 35 f2 asph Summicron. In fact, some ultra fast Leica lenses perform LESS well than the slower ones at middle apertures. You will not be able to convince people that at F8, lens performance is not really an issue when comparing primes, especially on centre. Heck, I have plastic Canon zooms that will give my Leica primes a run for their money at middle apertures when it comes to resolution in the middle. The corners are a different matter. FWIW this claim, yours and mine, is borne out by just about every credible testing website out there but I guess some people just won’t have it. If they understood how the MM sensor worked, compared to that of a regular colour CMOS set up, it might be easier to stomach…. Phew! I’m glad I’m not the only one who’s seeing this in reality. Thanks Tom. Hey. Wonderful review, but more importantly amazing photos! I’m please to have found your site accidentally. Hope to see you around the streets of KL one day 😀 Well done and keep up the amazing and inspirational work. Thanks Shah! Feel free to come up and say hi if you happen to see me. I don’t bite (well, most of the time anyway). sorry but you really seem payd by Leica…… ! As an M9 owner waiting (patiently) for his D800E, I very much enjoyed your review. I understand that there are limitations in your study due to available lenses, which you pointed out very clearly, but I still found the comparison enjoyable and informative. Suffice it to say that none of the vehement crictics of your methodology have done anything of comparable magnitude to help their fellow photographers, so we all know what that makes them (details witheld in interest of civility). Thanks Richard. 🙂 There’s room in your bag for both – they’re very different animals, IMO. I wouldn’t use the M9 in the studio, and I probably wouldn’t use the D800E as a documentary camera – but switch positions, and they’re perfect. I try to help people… and I was one that critiqued Ming’s choices – I have no motives except truth and fairness. So please do not pigeonhole me into whatever hole you have for all nay-sayers. Please? I’m open to all constructive, valid criticism/ observations – and RB, I appreciate your points because they fall into this category – and I think the other readers will agree. What we don’t like is when people criticize methodology without reading the ‘disclaimers’ first…no testing process is going to be 100% perfect, and no lab testing process is going to represent the real world. I don’t have time to do both, so I do something that answers the questions for me as a full time pro photographer who has to make a living from the gear. If that’s not the answer the audience is looking for, then there are plenty of sources on the internet. This post actually inspired me to start writing up a post that asks the question “what is sharp” and the image I am going to use is one that I shot on 15 year old TRI-X that I purposely underexposed and overdeveloped (found in a box from a bunch of moves ago). My intent is to enlighten and demonstrate that focus, composition, and scene/lighting contrast trumps all technical things including post processing. In my photographic journey I have come full circle in trying to understand what I like and why I like it. I know and acknowledge I am a strange beast that is some sort of even split between physicist and insane irrational artist that cannot seem to decide anything for sure even in my own head. I completely agree with that, and I’ve long been trying to say this at every opportunity: the camera gives you potential. The photographer fulfills it (or not, whatever the case may be). I think that will be an interesting post, would love to see it once it’s up! Ming has taken all the resources at his disposal and produced the most meaningful comparison of probably the two best digital cameras on the planet for us to absorb for free. He doesn’t deserve any disrespect of any kind for this. Any criticisms should be levied with appreciation and respect. Thanks Richard – but I think there were valid points in a lot of the comments, it’s just that people should have read the caveats first 🙂 In any case, I just want to state once and for all, I really appreciate constructive comments and discussion – even if you decide you don’t like one of my images aesthetically and rip it to shreds – that’s how we all learn. Hi Ming, I love the way you disect your subject material. This is real information photographers can actually use. Yes, I was one of the nay-sayers for using the 45, however never having used the lens myself I looked it up on Photozone. It received very high ratings and got a “highly recommended” thumbs up. No blogger is ever safe from the firing squad, but I must say I read all your reviews with anticipation as I use similar equipment and I think you are doing commendable work here. So keep those reviews coming (when you have time) and let me know if you ever find a way for one to make a contribution other than with PayPal. Thanks John! The edges may not be that good because of field curvature, and no, it’s not the ultimate lens resolution-wise, but center by f5.6 and f8 it’s more than a match for the sensor. I have one other question: Does the white balance setting in the D800e RAW before the B&W conversion affect the tonal response of the image in a way that with a certain value you can have a B&W output that matches the tonal response of the Leica a little more? It may do, but there’s not a lot we can do about that because the MM doesn’t see anything other than luminance. In any case, to be sure, I adjusted the WB of the D800E image to be correct for the light source before converting it. Ming: Thank you for the work you put into this comparison. I too wondered about the two lenses, but when I read your explanation it all made sense. Sorry if people are piling on you, the Internet is like that. To my eyes, the cameras are very close in resolution. The choice is really about tonal rendition and noise. The MM gives us ISO 5000 files that have rather pleasing grain like a medium-ISO B&W film. The D800E gives us almost grainless files at 6400, and more digital-looking noise and smearing at the stratospheric ISOs. But speaking of stratospheric, the MM’s price makes all this an academic exercise for me. I’m still happily shooting with an M8. I’d love B&W, and I’d love to have a digital M body that gave me better high ISO. But not at that price. I’m coming to the conclusion that I’ll have to look to another manufacturer and form factor for ISOs of greater than 800. Too bad, becaues when I was younger, Leica M was *the* high ISO camera. But times have changed. Thanks Peter. Glad some people are seeing sense, though! The M8 does great B&W conversions, I think it’s because of that bit of UV/ IR pollution leaking through onto the sensor that makes the blacks and skin tones ‘luminous’. I see it in my M8 files but I don’t see it in my M9 files – and that’s the main difference in sensor architecture. Leica have advised me that the spectral response of the MM is the same as the M9-P, which is a bit of a shame, actually. Great artticle Ming, thanks. Strange comments your getting though. Do people understand you’re comparing an 18 mp to a 36 mp camera? I would say I am amazed that the MM is holding it’s own, since you’ve used interpolation to uprez to the same resolution as the 800, that is incredible, no matter what lens you use. Imagine a 36 mp MM…. Somehow I have the feeling that the MM is a 1st step and experiment for Leica’s research to get rid of Bayer also for future M camera’s (color that is). Yes, it’s 18MP non-bayer upsized to compare against 36MP bayer. And I was amazed that the 18MP is more than holding its own. The problem with non-bayer color is that you’re going to require at least 3x the photo sites to deliver true color info, in which case it’s little more than pixel binning. They might use say a 36MP sensor with RGB filters, bin the pixels down to 12MP, and then get a non-bayer color sensor that delivers around 24MP of bayer resolution, but that wouldn’t be a significant improvement over the M9. I think while it’s a possibility, it’s still a little way off for now. Is it possible that the Leica ist underexposed about 1/3 EV (or the Nikon overexposed about 1/3 EV) in the last two comparisons with the model in the studio? Tonal response aside… to me it looks like the Nikon images are generally a little brighter which may spoil the result a little. The raw files had the same histogram. I was trying to match the shadow/ highlight transitions with the Nikon, and this was the result. Should’ve used the nikkor lens on the Leica for a fair comparison. No it wouldn’t, there’s no way of focusing it accurately on the Leica. Test the 50apo vs the 85 PCe – just re-frame or… give the D800 the reach advantage this time 😉 even I have a tough time NOT picking out the best performing lens when comparing a shorter lens to a longer lens (ie 50 vs 45) if the relative target size is not the same. I don’t have the 50 AA anymore, unfortunately. So no repeat tests. But the magnification difference between 45/ 50 and 50/85 is pretty huge, so that wouldn’t work. And the real world portrait test would look very different, too. On the Nikon 24 comment – I think I really need to get the 24/1.4 looked at again. I’m not getting the kind of sharpness I’d expect (or see from other lenses, like the Zeiss 2/28 Distagon). Would love to see a print that big with that resolution – I can only imagine the amount of computer power you’d need to create that stitch! 32G RAM in our machines and it puts a real hurting on them – those kinds of files rely on PSB files, can’t even save it in a PSD (>> 4G) – you would be amazed at how good it actually looks (still producing small sections to proof – will produce the whole thing sometime in July). Shot with the 28 HC and the Hasselblad tilt-shift adapter (one of the very few in the USA due to the patent infringement case). 10 frames using H4D-50. It will be our largest so far that has been designed to be a walk-up. It’s overwhelmingly good at about 3-4′ away and about as good as your monitor close up. This particular installation is about 65 prints – the vast majority in the 4 feet wide range 🙂 Mix of H4D and some D800 images. Cool! How do you find the D800 prints at that size? D800 in my limited experience so far looks great at 4 feet wide… of course from a reasonable viewing distance. Then again I have made some 6 foot by 9 foot prints from D700 files (shot with the 24 PCe)… They look great from 4 or 5 feet away. It is very very image dependent NOT just camera dependent… The reason for the stitched images on the 29foot print is that the image required a lot of detail to look good (we had to reshoot it more than once) … other images that are more graphic are more forgiving in how much actual detail you need – so are more lens dependent. Still looks good for a budget print! Your experience with the D700 agrees with mine; my commercial mainstay is watch photography and 4ft is about the largest I’ve seen the D700 enlarged to – still looked good, but as you say, it’s a graphic subject with plenty of bokeh. I’m pretty sure a landscape wouldn’t hold up that well. Oh one other thing – My 24 N is fantastic – not as good as the PCe but still amazing… even better than my 28 1.4 from what I can see. I’m wondering if there’s something wrong with my lens, or whether it’s the same asymmetric focus issue rearing its head again. Do you shoot it wide open much? Agree on the assessment vs 28/1.4, by the way. That wasn’t that impressive (IMHO) even on the 12 MP FX cameras. Yes wide open otherwise 24 PCe – to tell you the truth I shoot mostly film now and stick to smallish cameras for my personal work. I quit shooting fashion a few years ago as I was burnt out (was shooting H2 w/ Leaf). I work with many photographers and test their equipment and make critical use recommendations as I specialize in producing gigantic print work for them… in the process of making a 29’x10′ print ATM (H4D stitched pano) so I am quite familiar with what all this crap is capable of. To my eye the Nikon is more pleasing but I would like to see the Zeiss 50/2 used instead. The 45/2.8 is not such a great lens IMHO and certainly no match at all for Leica’s best. Body+Lens price is not so much of an issue for me (it’s not a total non-issue though) but for many the basic kit cost differential is huge and one has to wonder, is it really worth it? 1. Yes, the 45P is older, but in the center at f5.6 or f8, it’s pretty darned good. There’s a reason why I own one of these; what I’m seeing at the pixel level at f8 in the center with the 45P in the center is on par with my 85 PCE, whose optics I think nobody will argue about. 2. I didn’t have a Zeiss handy. And since nobody pays me to write these things, I wasn’t about to go out and spend a bunch of cash on one, either. 3. We’re comparing sensor differences. So yes, resolution is one, but we can look in the center – it’s a pretty even playing field when stopped down. Dynamic range, tonal response and noise are not lens-dependent properties. I could have used OOF shots of a tonal gradation for these, with any lens (or no lens, even!). Can’t argue on the last point. If you look in the corners – and I didn’t because that would turn it into a lens comparison – then you’d see there’s an enormous difference even stopped down; it’s much more obvious wide open. That’s what you’re paying for, in this case…along with bokeh/ acuity/ color reproduction/ APO performance (on a color body at any rate) etc. Pleasing, look at the noise structure of the Nikon, I don’t think this has anything to do with the lens. The Leica image looks much more natural to me. Sharpness has to do with the lens, but tonality and noise do not – I’m inclined to agree with you. Ming, If the gearheads can’t be bothered to read the comments and keep asking the same questions, I wouldn’t feel compelled to reply. I wonder are Nikon now brute force following Leica via viral marketing and social media! Anyhow as a large format printer I appreciate the value of your truly practical approach, 18 vs 36 MP comparison at this level of performance. Many more M8 files I saw could be printed larger than many D3X files I had seen. Seeing the D800 perform so well against the MM with a discontinued plastic Nikkor mounted on the front is quite impressive. It makes me very curious to see how they would compare with better glass on the D800e. Maybe a $1,200.00 Zeiss instead of a $450.00 discontinued plastic Nikkor against the $7,000 Leica glass. 1. For what we are testing here, i.e. the sensor, the lens is not so relevant. 2. 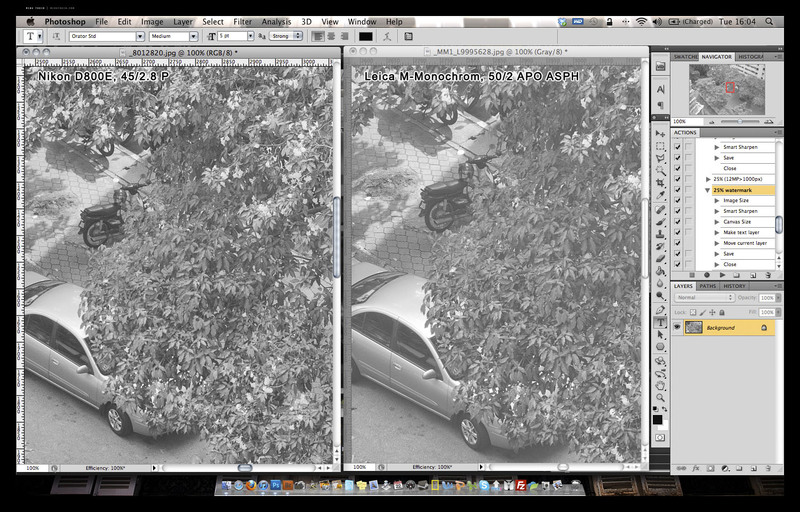 Look at the center crops and sensor properties like noise, overall tonal response and dynamic range. The latter three are not lens dependent. 3. The center is a fairly even playing field for comparing resolution because both lenses are resolving as much as the sensor’s limits by f5.6 or f8. 4. I would have used the Zeiss 50/2 for the Nikon, except – I don’t own one, I used what I had. Nobody pays me to do these comparisons or reviews, certainly not Leica or Nikon. I’d also suggest you use the 45P before you write it off. There is a reason why I own one of these, and it’s not size or price. I do not feel the 45P is a compromised lens. Nor do I feel that price necessarily plays a big part in the equation, as we’ve already proven with the S2 vs D800E comparison. And again I was slammed for my various lens choices in that article (one of which WAS a Zeiss): I use what I’ve got providing it’s suitable, and right now frankly there are very few good lenses on the D800E – I know, I’ve been looking for them. 5. On the D800E, lenses you’d expect to work well doesn’t always, and vice versa. The 85/1.4G isn’t particularly special, and the 28-300 suddenly develops surprising central resolving power. Go figure. Roger Cicala did extensive testing of various lenses on a D800E and showed quite clearly that center resolution is not out-resolved by the sensor. Loyd Chambers came to similar conclusions. And the 28-300 did not fair well on MTF 50 on the D800e, with central resolution of 922. The 85 1.4 showed central resolution of 1044. Zeiss’s 25f2 lmatest results showed central resolution of 1216 MTF 50. Do you really thing the 45P could touch that? Do you think the Leica 50 could not? I also owned a 45p, and quickly got rid of it when I found the Voigtlander 40mm f2 to be superior lens in every way. The 45p did not perform well on a crop body, I wouldn’t think of putting it on a full frame. My experience with the 45p also showed that for me it was much sharper at f5.6 than f8. If the lens doesn’t matter, a Nikon F to M adapter costs about $50.00, then you could test both cameras using the 45P. I’m going according to what I see in images shot with a variety of lenses and both D800/ D800E bodies at optimal aperture. I’m not going to buy lenses for a test whose sole purpose was to document personal curiosity for the benefit of my readers. You are of course free to come to your own conclusions, but at the end of the day, the photographer matters a lot more than the camera or lens used. Do I doubt the 50AA is a better lens – absolutely not, because it is. Does the lens used affect noise, dynamic range or tonal response of a sensor? No. I ran multiple tests at multiple apertures. I didn’t post them all because of time and bandwidth. Look at the real world portrait crops: I don’t see how any lens could be much sharper than that at the pixel level, including the 85 PCE which happens to be what I do the majority of my work with. The 45P suffers from field curvature wide open, which is why the corners appear poor. If you focus at the central point and then move the camera to re-frame, you’ll find the intended focus point is sharp. It’s a known issue with Tessar designs. I have a F-M adaptor, but there’s no way of accurately focusing it because no M body has live view. This would lead to focusing-induced resolution issues. This is a fairly useless comparison in my opinion and don’t really understand what you were trying to figure out. For some reason I feel compelled to comment even though I really don’t care about whatever the results you came up with are. I have shot (and continue to) with Leica, Nikon, and Hasselblad gear for over 25 year, I have no axes to grind. I just have to ask what on earth would posses you to use the Nikon 45p? The shocking result to me is that the D800/45p combo comes anywhere near the technical results that you achieved with the M9m + $7000 summicron. This is shocking anyway you look at it… yes the 45p can be pricy but that is not in any way related to it’s performance – in fact the performance can probably be blown away by just about ANY other Nikon lens, zoom or prime. This makes no sense to me whatsoever. If you don’t care and feel the comparison is invalid, why comment? 4. I would have used the Zeiss 50/2 for the Nikon, except – I don’t own one, I used what I had. Nobody pays me to do these comparisons or reviews, certainly not Leica or Nikon. I’d also suggest you use the 45P before you write it off. There is a reason why I own one of these, and it’s not size or price. No, it’s not a fair comparison, but we’re not comparing optical performance of the lenses – that would have been unfair. But since we’re looking at sensor properties and center resolution when stopped down only, we can ignore most of the limitations of the 45P. I think you might be well served to at least give your PCe a try against the new Summicron and redo the comparison just for your own satisfaciton. I was stunned at the performance of the PCe lenses on the D800 – I knew they were good but I really didn’t know how good until I saw them on the D800. Either I am just lucky or the 2 PCe Nikkors I have are some of the best performing lenses I have ever seen. I am including my Leica glass in this comparison (I own a few summicrons last non-asph version and the newer asph versions of both the 35 and 50, the 75 lux, the 90 APO, and a few others that are not quite as technically good). I would, except – I don’t have the 45 PCE, and the 50 AA went home after two days. 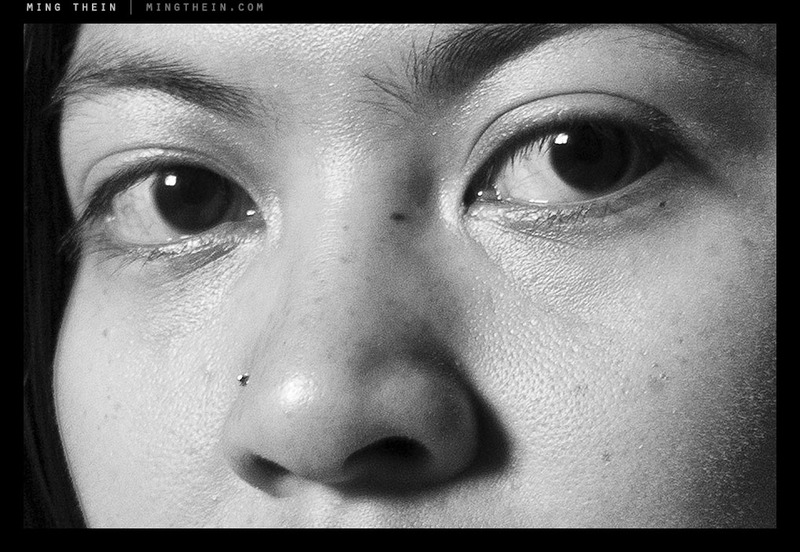 The 24 PCE and 85 PCE are the best lenses I’ve seen so far on the D800E though. This is not just gear talk. I’ve been learning a lot about how to see and compare visual elements, micro contrast, colors… Also, I have changed my quality references. That’s why we are all pleased. Thanks! Hi Ming. Enjoyed your three part review. Looks like anyone who buys the Leica Monochrom will not be disappointed. The Nikon 800E looks like it is going to be out of stock well into next year. It looks like one killer camera. Great test. You mentioned the Zeiss 50mm Macro for the Nikon, however I’ve seen your photos with the Nikon 60mm Macro, which look stunning and it is a very highly regarded lens. Do you believe (or know) that the Zeiss is actually better than the Nikon 60mm ? Thanks. I know it is, but I don’t use one because a) it only goes to 1:2 and b) the working distance is too short because the front element is heavily recessed. Hi Ming, Great series, but I really have to say that using the Nikon 45 2.8P in contrast to the Leica 50AA is, well, silly. As far as I’m concerned it invalidates the comparison (or at least devalues the work that you’ve put into it). I have both Nikon D800E and the Nikon 45 2.8P and I can tell you that after my initial user tests that lens won’t be attached to the D800E again – I have better choices available to me. I also shoot the M9 with the 50 ‘Cron and have directly compared it to the D800E (including the Nikon 45P). Your reviews are wonderfully written and your aesthetic and purpose are usually very well served – but with this article I have to take exception. Please read the other comments before asking the same question for the fifth or sixth time. For what we are testing here, i.e. the sensor, the lens is not so relevant. Look at the center crops and sensor properties like noise, overall tonal response and dynamic range. The latter three are not lens dependent, and the center is a fairly even playing field because both lenses are resolving as much as the sensor’s limits by f5.6 or f8. I would have used the Zeiss 50/2 for the Nikon, except – I don’t own one, I used what I had. Nobody pays me to do these comparisons or reviews, certainly not Leica or Nikon. I’d also suggest you use the 45P before you write it off. There is a reason why I own one of these, and it’s not size or price. First, you admonished me for not reading the other comments before making mine. Understand that when I wrote my reply to you none of the other comments had yet been posted likely because you moderate them, so I could not read them first. For this, I think you owe me an apology. But hey, it is your site and I am but a guest. Second, I do use a 45P and have for over 15 years, both on film and digital (D3x) – and recently (last week) tested it against the Leica 50 Cron on my D800E. And I tested against a borrowed 50 f/2 Zeiss ZF.2. I read your article and the lens would make a difference in what you surmise you see from the sensor. You even speak about it in your review (comparing 50AA corner to 45P). There is a difference between my 50 Cron and 45P even at f8…. But we can agree to disagree, right? Third, and finally, you’re reply to my comment is hostile and rude. Please remove my posts from your site. I won’t be back and I’ll be sharing this exchange with others on additional photo sites. Summary: don’t compare two cameras head to head, one with a $7,000 lens and the other with a $500 lens. Just invites people to not take you seriously. I’ve spent the last hour addressing comments like this, so I apologize if the order got mixed up and you didn’t get a chance to read my thoughts somewhere else. My bad. So I apologize if my reply seems rude, but I would also note that your initial comment wasn’t exactly friendly, either. I mention the corners only once – and that’s because I know it’s an unfair fight, and was never the objective of the comparison. But it’s included for the curious. In the center, at the pixel level, I see very little difference to the 85/2.8 PCE, which I don’t think anybody will question is an excellent lens. How did you use the Leica 50/2 M on your D800E at normal focus distances? Unless there are some optics in the adaptor (which would again affect the comparison) it isn’t possible to focus to infinity. I have an M-F adaptor, but didn’t use it because the focus ranges would be hugely different (I think about 15cm or so on the D800E). I would not spend the amount of time and effort I do if I ‘didn’t want people to take me seriously’. I am doing a practical comparison not a lab bench test. If it didn’t make sense, I wouldn’t have done it in the first place – and it wouldn’t be a conscious choice I make when picking out equipment for the day. Frankly, if the 45P is as crappy and useless as everybody seems to think it is, then the fact that it does this well at all is pretty darn amazing – and I think I’ve only seen one person say that. Finally, I moderate comments because I want to make sure I reply to everybody individually – if I didn’t, then chances are I’d miss something and that would be unfair to people who took the time to write. We can agree to disagree, but why would you want me to remove your posts if you’re going to ‘share this exchange with others on additional photo sites?’ This seems more than a little one-sided. You’ll see that I approve and respond to every comment, positive or otherwise. It would be arrogant and missing out on opportunities to learn if I did otherwise. You were in possession of a preprod MM which makes you a Leica tester and yet you choose to match the best Cron produced by Leica with a sub par Nikkor 45P. Do you think this takes away any objectivity from the test or simply adds to it when pitting the best of Leica glass against the lowest of the Nikkor glass and yet Nikon comes top? Maybe you would care to comment for credibility issues. Or probably just delete this post. Alan, firstly, I’m not a Leica tester. I was loaned one for two days after the announcement because I requested it to review. Secondly, nobody – certainly not Leica – pays me to do these reviews. This means that thirdly, I don’t have the money to buy glass specifically for tests, and there’s zero rental market in this part of the world. I’ve said this at least four times already. For what we are testing here, i.e. the sensor, the lens is not so relevant. Look at the center crops and sensor properties like noise, overall tonal response and dynamic range. The latter three are not lens dependent, and the center is a fairly even playing field because both lenses are resolving as much as the sensor’s limits by f5.6 or f8. I would have used the Zeiss 50/2 for the Nikon, except – I’ll point this out for the umpteenth time: I don’t own one, I used what I had. I’d also suggest you use the 45P before you label it as ‘sub par’, because it certainly isn’t. There is a reason why I own one of these, and it’s not size or price. In all honesty, I believe that the Leica 50mm lens is skewing the results quite significantly. I would REALLY be interested to see a more apples to apples comparison, but all in all you did an excellent job. What in also quite interesting is how an $8,000 camera and $7,000 lens compare to a $3,000 camera and significantly less expensive lens. As the owner of a Nikon D9800E and M9, I can tell you that the M9 holds up well against the Nikon with Prime lenses, but the Nikon is more than incrementally superior with respect to image quality. Look at the center crops and sensor properties like noise, overall tonal response and dynamic range. The latter three are not lens dependent, and the former is a fairly even playing field because both lenses are resolving as much as the sensor’s limits by f5.6 or f8. I would have used the Zeiss 50/2 for the Nikon, except – I’ll point this out for the umpteenth time: I don’t own one, I used what I had. I agree. The pancake is nothing on the 50/2 APO Aspherical as evidenced by the enormous price differential. Because price is the ultimate differentiator…more expensive must always be better. Hi Ming, once again a very well detailed examination. I have two observances which may (or may not) be relevant. The first is the dmax seems better with the Nikon, which may be totally irrelevant. The second is why use the Nikon 45? Perhaps that is all you had, but if you’re going to compare the very best Leica has, then I would have used a Zeiss 50 Makro on the Nikon. You can pick up a 45 for peanuts – the 50 AA is seven freaking thousand dollars!!! And after all your tests, I’m shocked the Leica didn’t blow away the Nikon. To be that close with an older lens is just amazing. It would also seem the new Nikon sensor is really, really good. Thanks for publishing all your results and yes, I for one, am most interested in your PP workflow. Agree that dmax seems better with the Nikon, but if you look closely (at the full size files at least) the transition zones between shadow and mid tones and highlights and mid tones doesn’t seem to be as smooth; however, the Nikon has slightly more dynamic range. I think it’s a function of the native response curve of the sensor. I used what I had for the tests – and no, I don’t buy new lenses for tests because nobody pays me to do these. A 50 Makro-Planar isn’t something I own right now. In fact, the closest thing I’ve got to 50mm in F mount is the 45P. The point of the test was to compare sensor properties, not lens resolution. And in the center by f5.6 or f8, both lenses match their respective sensor’s resolution anyway. Hi Ming, I think the look of your missus is there too familiar, “When are you going to put that bloody thing down and go to bed”. Seriously though, lovely portrait. Nice a and simple. I wanted to ask about the posterisation on the wall in the MM shot. Is that visible in print/TIF or is it just the conversion for web that caused it? Yes, that look makes you work faster! Posterization isn’t there on the full size shot, it’s very much due to the JPEG compression. Ming, thank you for the 3rd part. I agree – but I also had to make do with what I had on hand. I would have preferred to use a Zeiss 50 makro-planar on the D800E actually. Thanks for such a informative and detailed comparison. For me the last two comparison images sum up the whole review…non-Bayer offers a much higher per pixel sharpness compares to Bayer. It’s rather frustration having those artifacts of the latter when I try to do very large prints, regardless of megapixels. Yes, even higher megapixels does kind of hide the fact, nonetheless with you match a non-Bayer to such a high resolving power lens (in this case, the 50/2 Summicron), it stands out and leaving a similarly spec’d system in the dust. 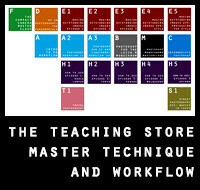 As for test runs from the MM, I’ll bring some files over next week when I go see about that Gitzo – will give you a call. I think what is interesting in comparing the two cameras is which looks more pleasing. I used to have both an Imacon film scanner and a Nikon film scanner, and when I blew the scans up to 100% the Nikon was the sharpest. But when I zoomed out and looked at a larger section, the Imacon appeared sharper, more 3D, detailed and alive. And with better colors. 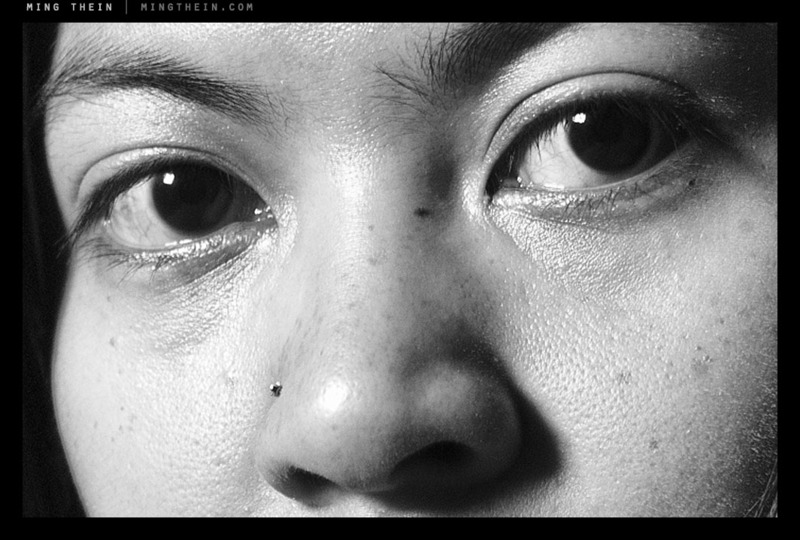 So in a way, the face in http://www.flickr.com/photos/mingthein/7249128430 would be the most interesting part. Which looks the most pleasing and real (alive). Of course the question if a 18MP with the worlds presumable best 50mm can beat a 37MP camera is interesting. But in real life, how does the images look on a wall or in a magazine, is the relevant question. Hello Thorsten! Pleasingness is a very subjective thing…but I prefer the MM for its highlight ‘shoulder’ and shadow ‘tail’. I’ll be doing some print tests next week if time permits, should be interesting…in fact, I’ve got some landscapes with the MM and 50 AA that I’m still processing, but they definitely show promise to make some stunning enlargements – because of both tonal detail and resolution. Hello Ming, excellent comparison, and having a long list of great Nikon glass and the D800E was on my wishlist before the Leica M was announced. Looking at the review though I am just asking myself – and you – is it really a sensor to sensor review given that the lens in front is so different both in design, price and age – how did that influence the outcome? Another point on the high ISO response, you mention that the shutter type on the M makes up for the 1stop difference, but in my experience the problem in low light is more related to subject movement than camera shake. Just my two cents. Hi Lars, I agree that it’s not quite a like to like comparison, but there’s no way I could have used the same lens on both cameras. Some things like dynamic range and ISO performance are entirely sensor-based and not influenced by the lens. Sharpness of the 45P in the center region when stopped down is fairly close to the top of the heap of lens performance on the D800E I’ve seen so far. It is a Tessar pancake, but with modern coatings and glass – I think the lens dates from around the early 2000s. If you look at the center portion of the image, where both lenses are resolving as much as the sensor can deliver – it’s clear that there’s an advantage to the non-Bayer sensor, by a noticeable margin. The corners are of course lens-dependent. As for shutter motion…you don’t always photograph moving subjects in low light; for static scenes, the lower shutter vibration would definitely help. Many thanks, MT!! Terrific 3-part series – great idea with the two day separation between episodes – it’s been a bit like waiting for a favourite TV episode… I wasn’t expecting the comparison with the D800E in this final part and this made for a very interesting comparison: the Nikon looks like a brilliant piece of equipment. The MM is no slouch on the ISO front and I could scarcely believe the results from the D800E. As it turns out I prefer the simplicity of the M and I’m emotionally tied to B&W. It’s been a huge decision, but I have placed a pre-order for the MM and I do want to thank you for this series which has helped a lot. When the camera turns up, I’m intending to sign up for the tuition course you offer, with a specific focus on B&W and the MM – I think this will help in setting my head right as I set out… Anyway, I’m looking forward to three events – that is the MM turning up, concentrating on B&W only and the course! You mention to make sure you also have the right lenses to do it justice. This caught my attention as I need a lens and I’ve been giving this a lot of thought. I’m going to start with a new 50 on the MM – and then I’ll add a 28 or 24 (or maybe a 35) down the track. Only one of these needs to be fast. I would very much appreciate your thoughts on this. It somehow seems significant that Leica have released both the MM and the new 50 at the same time. My pleasure, Pete. Took a while to write all of this, hence the originally planned separation – just in case I didn’t have time to complete it all by the end of the first day! Congrats on the new MM, yes, please shoot me an email on the course once it arrives. The new 50 is awesome, but the price is rather steep. I’d probably go for the 50/1.4 ASPH or the Zeiss 2/50 Planar. Can’t say I’ve used an M mount 28 that I like yet, though the 28/2 Summicron ASPH is supposed to be excellent. The 28/2.8 ASPH is technically great, but somehow lacking in character in a way I can’t quite put my finger on. Best choice of 24 is of course the 24/1.4 ASPH, but you’ll need an external finder AND still have to use the rangefinder to focus precisely, which is a bit of a slow process. I’d skip 24 and go for the 35/2 ASPH or 35/1.4 ASPH FLE instead, both of which are excellent lenses – the latter perhaps my favorite 35 of all time. Thanks for taking the time to reply to my question, MT, it’s appreciated – as is the advice. What you say makes perfect sense and as with all good ideas it’s (now) blindingly obvious! I’m just about to order a 35/1.4 which is a pretty exciting prospect! Once again, great idea for the Part 3 review and thanks for putting yourself out there with a highly original review. I’m bewildered/bemused/surprised by the tone of some of the replies – I felt the review was quite even-handed and went to great lengths to explain test limitations – plus it had something for everyone. As a Leica enthusiast I’m pretty chuffed that the MM did so well against the awesome new Nikon. I would have thought that there was a big take home for non-Leica aficionados given that the MM had the new 50AA lens on board and the sensor is without a Bayer array. I must be getting old, but I do struggle with the basic lack of civility that seems to pervade so much of our internet communications these days. No problem – enjoy your 35/1.4 (and make sure it’s the latest FLE version). I actually grew up in Melbourne; haven’t been back for ages but definitely plan to in the near future. Will let you know if I’m in your neck of the woods – thanks for the offer! Hi Victor, thanks for the compliments. Happy to do an interview, could you send me an email so we can take it offline? (mingthein(at)gmail.com will find me). Thanks!